Our first ever women’s only mountain trail running clinic. Photo by Jay Philbrick. We’re stoked to introduce our first (of many, hopefully) Women’s-only Mountain Trail Running Clinic. This first event will take place on July 16, 2017, and will culminate as a guided traverse of the Southern Presidential Range in New Hampshire’s spectacular White Mountain National Forest. 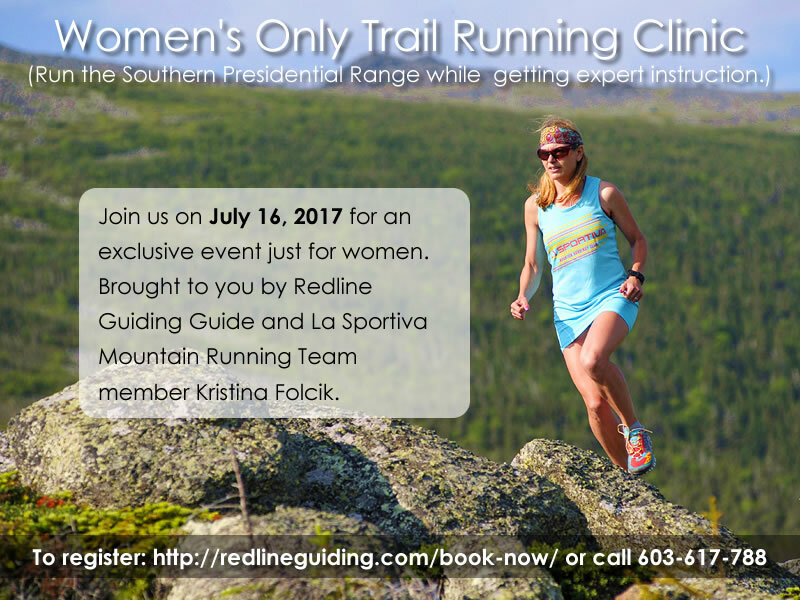 This event will be led by Redline Guide and La Sportiva Mountain Running Team member, Kristina Folcik and will be open to five participants. Our normal guide ratio is 1:4, but Kristina has been kind enough to allow a fifth. This should be an awesome event for runners wanting to up their game, so to speak. Kristina will be covering all of the material in our normal Trail Running Intro Course, but it will be geared toward women, specifically. Normal pricing for this course would be $200 for the full day, but for this event we are taking 40% off (you save $80) so you pay only $120. That’s a great deal to be guided and taught by a recognized expert like Kristina! To register, please use our regular booking form to register now (as this signs our waiver which is required for a paid event). Choose the date, and mention “Women Only” where it asks for such a thing.